2 cups of brown Basmati or Jasmine rice. 1/2 cup of Wild rice. 1 small packet of frozen vegetables (peas, carrots, and green beans) or fresh vegetables cut into bitesize pieces. Can use cauliflower, broccoli, carrots, and green beans. 1. Wash the rice in the rice cooker as you normally would and immerse the rice fully in water, adding an additional 1-2 cups of water over the surface of the rice. (The amount of water really depends on the quantity of vegetables used). 2. In a separate pan, heat up 2 tbsp of oil and fry 1 finely sliced onion. As the onion starts to brown, add some finely grated or sliced ginger, 1 tsp of salt, 1 tsp of coriander powder, 1 bay leaf, 2 small cinnamon sticks, and 1 cardamom. Allow to fry for a further minute. 3. Now pour the fried mixture into the rice cooker and stir. 4. Add the cut vegetables of your choice. 5. Put rice cooker on and allow to cook until done. 1. Wash and drain the rice and let stand for atleast 10-15 minutes so it dries out. 2. Finely slice 1 onion into thin strips. 3. In a non-stick pan, fry the onions in 2 tablespoons of cooking oil until they turn nice and brown. 4. Finely grate the ginger using a cheese grater. If you don’t have one, blend/grind the ginger for the same effect. 5. Add the salt and coriander powder as indicated above and stir for 2 minutes. 6. Add the grated ginger, 1 bay leaf, 2 cinnamon sticks, and 1 cardamom. Fry well for 2-3 minutes. 7. Add the rice and continue to stir until the rice starts to dry up a little. 8. Estimate the amount of water you need to add by adding enough to cover the rice and allowing for at least 2 cups) of excess water. The amount of water really depends on the quantity of vegetables used. You don’t want to add too much as pilau should not be soggy. Neither should it be crunchy if too little water is added. 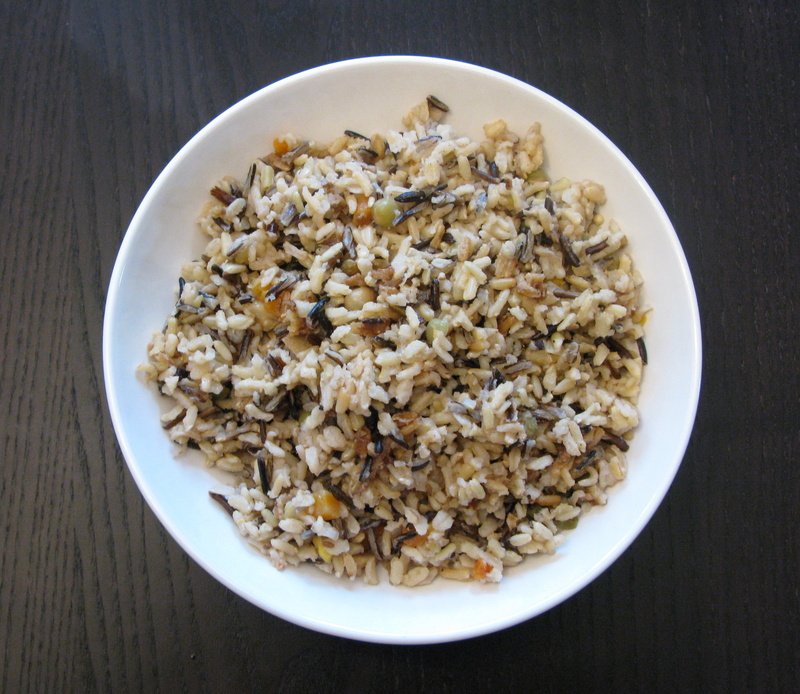 Do note though, that brown rice requires more water and a longer cooking time. 9. Add the cut vegetables of your choice and stir once. 10. Let simmer on low heat for atleast 15 minutes until most of the water has evaporated. When this happens, you’ll want to put the lid on and allow to simmer for a further 5-6 minutes. Do NOT stir the rice again. Doing so will make it mushy. Remove from heat when done and allow to cool for about 15 minutes before serving. Recommendations: Goes really well with Raita (plain yogurt mixed with cucumber and a touch of chilli powder).